Batuk Bhairav is the child form of Bhairav – Shiva. In Batuk form, Bhairavnath is childlike and is innocent witness to happenings in the world. Batuk form is used to visualize and symbolically represent the one pure atman. Batuk Bhairav is also known as Gora Bhairava – he is white in complexion – gentle. This child form of Shiva is sometimes shown as holding a head. This head symbolizes the ego or aham. It is also the fifth head of Brahma that Shiva as Bhairava removed. The head also represents Adharma or those that desire to dominate living beings and the world. 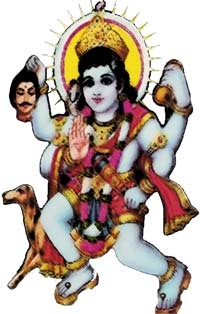 Batuk Bhairav is represented as a child with four arms. One arms holds the head of Brahma. Another holds the damaru. The third hand holds a small mace and the fourth is in blessing posture. A dog follows him constantly. He is the embodiment of faultless bodily attributes. He is known as Sphuradindukanti Deva - a God emitting the charm of moon. He represents Prana Vyapti - the pervasiveness of prana. According to Praksamvit Prana Prinat, Batuk is believed to be the representative of pranashakti because he is a son of Samvitti Devi. She is the goddess of knowledge power. The worship of of Batuk Bhairav is available in different books of Tantra. The eanishatyakshara (twenty-one letter) Batuk Bhairav mantra should be obtained from Gurumukha (the mouth of the enabled spiritual teacher, guru). Brihat Tantrasara contains in detail about the worship of Batuk Bhairav. Then angulinyasa is performed. This is the invocation of deity on the tip of the finger. Then hridayadinyasa is performed. This is invocation of the five forms of Shiva in the heart or consciousness. The five forms are ishana, Tatpurusha, Aghora, Vamadeva and Sadyojata. According to another custom, the saptavarna (seven color) is worshipped. After chanting of 21 hundred thousand mantras, one cycle of japa is completed. In another form of worship one of tenth part of offering of trimadhu to havan is performed. One of tenth offering of ritual water is necessary part of another worship. A balidaana or sacrificial offering is performed at night by some devotees. A size of mouthful (kavalopma) of pinda (shapes) from pua made by rice, meat, ghee, sugar and sugarcane juice is offered to Batuk Bhairav. The three types of contemplation are Sattvika, Rajasika and Tamasika. Sattvika contemplation leads to the removal of untimely death. Rajasika contemplation helps in achieving long life, health, dharma, money and fulfillment of desires. Tamasika contemplation leads to destruction of enemies. Batuk Bhairav Yantra is of great importance. Wearing of the yantra makes life free of troubles. In the center of bhupara in below the base in the Batuk Bhairav Yatra is a circular line of Ashtadala Kamala, eight petaled lotus. It is formed by means of ascending and descending lines. There is a triangle in its center. In the center of that triangle there is a pervasiveness of mantra. In some worship system, Dakshina Kali puja is also performed to Batuk Bhairav. In some Tamasik worship puja of the army of enemy is offered by means of Bhavatmaka.